Nav means nine and Raatri meand night. Hence, Navraatri means nine nights. Navraatri is a dedicated time where the worship of Devi Maa is worshiped for nine nights. 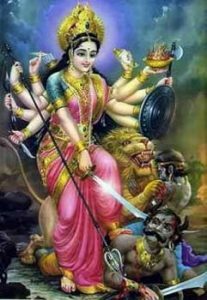 Navraatri is celebrated as a triumph of good over evil. It was during this time that Durga Maa destroyed the demon Mahishasur who was half man half buffalo. It is a reminder for the devotee to destroy the beast within man. Navaraatri is also considered as the time when Shiva and Parvati were married. As a result, it considered an auspicious time to get married. It is a time for husbands and wives to pray for a successful marriage. Navaraatri is also observed as the nine nights when Parvati would visit her parent’s home. Lord Shiva would stay awake and pray for her well being and safe return home. In this manner, we all pray for this Divine Goddess to return into our homes and shower us with her blessings. There are variations in the worshiping of the Divine Mother during this time. Here are some of those variations. 1: Durga is worshiped for the first three days, Lakshmi is worshiped the second three days and Sarasvati is worished the last three days. The devotee firstly prays to Durga for protection since we all need to be protected in our journey of life. Next, prayers are offered to Lakshmi for prosperity. Since Lakshmi is the goddess of light and prosperity, the devotee is hopeful that She will enable them to see the righteous path they should travel. And finally, Sarasvati is prayed to for purity and everlasting bliss.